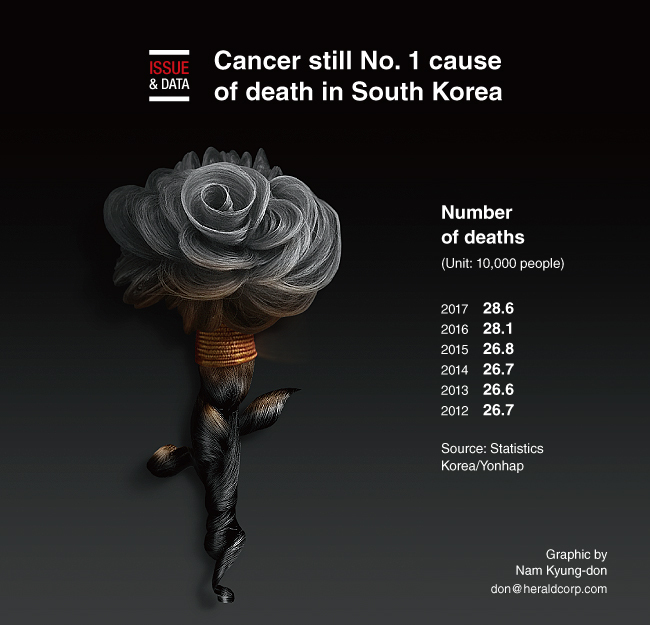 Cancer remained the leading cause of death in South Korea in 2017, with heart-related illnesses second, government data showed. A total of 285,534 South Koreans died in 2017, up 1.7 percent from a year earlier, according to data from Statistics Korea. Of all deaths reported last year, 78,863 people died of cancer, or 27.6 percent of the total, making it the leading cause of death in Asia’s fourth-largest economy. The death rate -- the number of deaths per 100,000 people -- from cancer rose to 153.9 last year, up from the previous year’s 153.